We have seen that Petersburg has been under Memoranda of Understanding (MOUs) with the Board of Education since at least 2004. 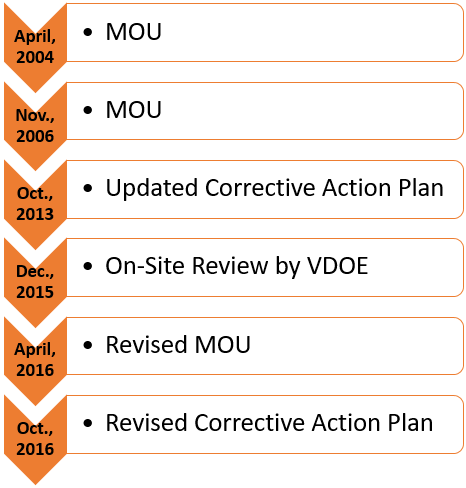 The 2016 MOU and Plan are attached to the Board’s October agenda. 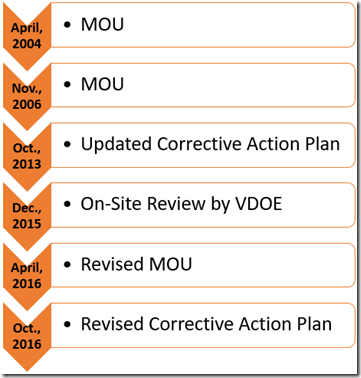 The Plan was adopted by the Petersburg School Board (search for corrective action plan) on September 21. 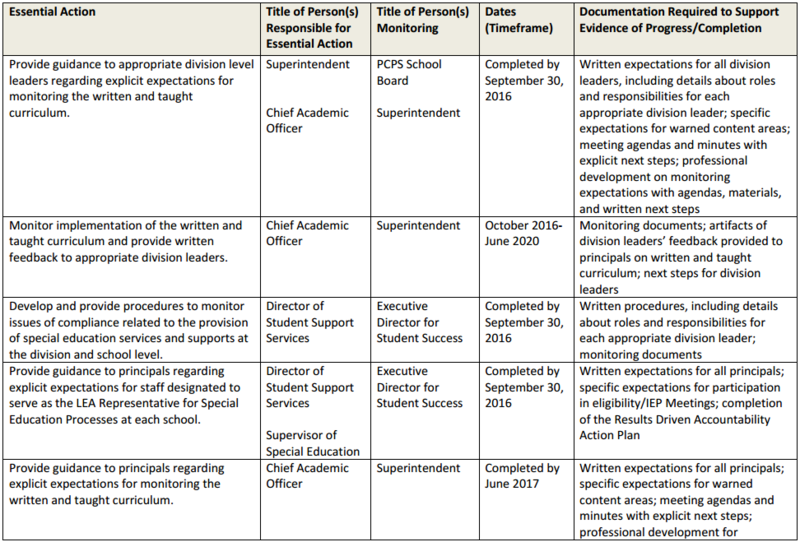 Given that it must reflect the Board of Education’s latest thinking in the face of a longstanding problem, let’s look at the Plan. At first glance, this offers some hope: The Plan identifies a person responsible for each item and a person monitoring the responsible person. And there are deadlines. A closer look, however, reveals that there are no quality measures. It’s enough to “provide guidance” or “monitor” or the like. 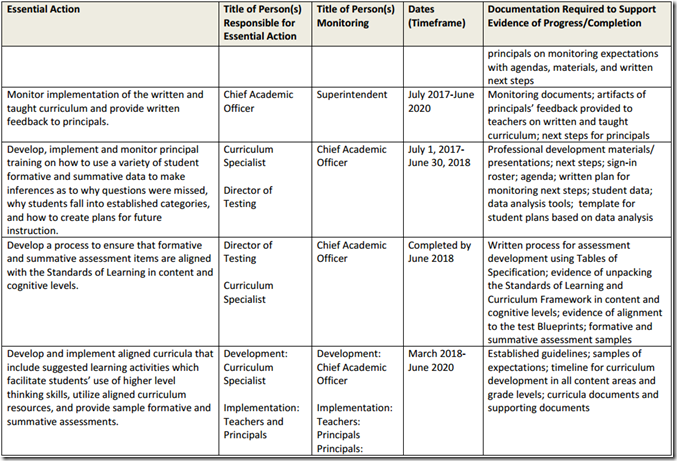 It’s interesting that Petersburg has been under MOUs since 2004 and it still has to be prodded to “provide guidance” and “monitor” things like curriculum. To the point here, none of that stuff deals with what is important: What kind of job are the teachers doing and how much are the kids learning and what happens when either of those is inadequate? 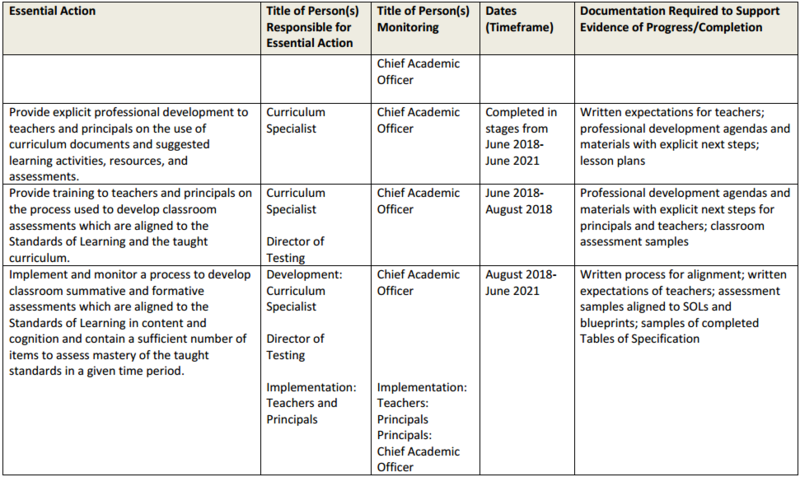 Implement and monitor a process to develop classroom summative and formative assessments which are aligned to the Standards of Learning in content and cognition and contain a sufficient number of items to assess mastery of the taught standards in a given time period. Of course, as to end of term measures this would reinvent the SOL testing and Progress Tables provided by the Board of Education. 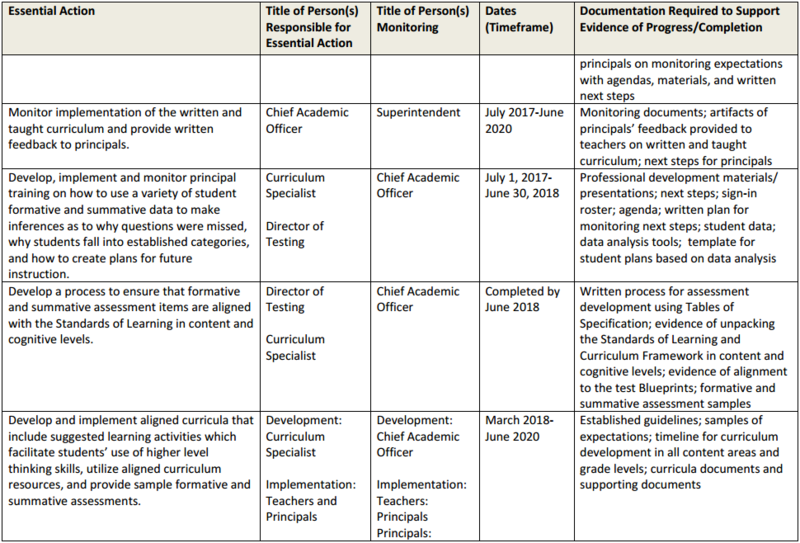 Redundancy aside, there are no measures here of what constitutes adequate performance, either ongoing or end of term; there is no mention of what the schools will do for students not making adequate progress or what they will do for or to teachers who do not produce adequate progress from their students or what happens to principals or the Superintendent in the absence of adequate progress. The Human Resource section of the Plan, pp. 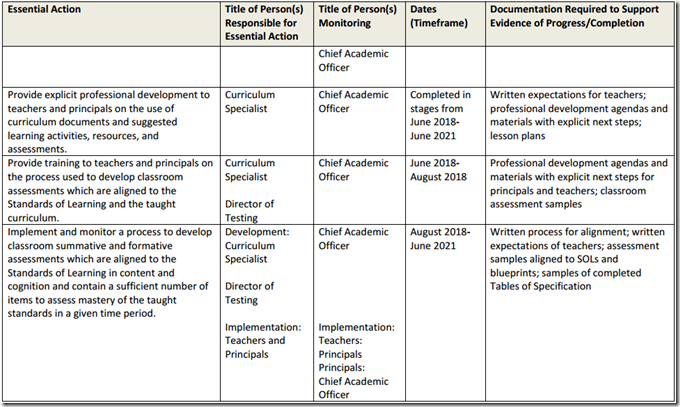 10-13, does deal with professional development. But the most it requires is paperwork as to needs for and “feedback” from that activity. In short, this “Plan” is all about inputs. It fails to measure or demand adequate outputs. As to the purpose of any school (learning! ), there is no plan here and no accountability. 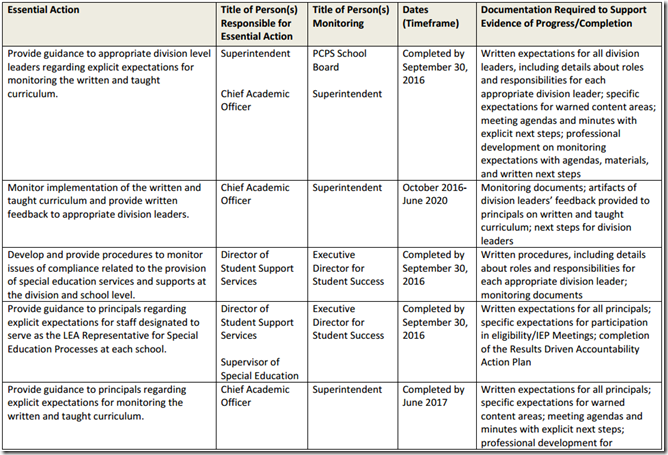 Petersburg being the poster child for the massive and ongoing failure of the Board’s accreditation process, we can be sure that this “Plan” represents the best that our Board of “Education” knows to do to fix a badly broken school system. Which is: Erect a paperwork Everest and hope for the best. This is worse than wasted effort; this is a malign assault on the schoolchildren of Petersburg. But, then, we already have seen the Board members themselves admit (Sept. 21, 2016 video starting at 1:48) that they don’t know what to do about bad schools.